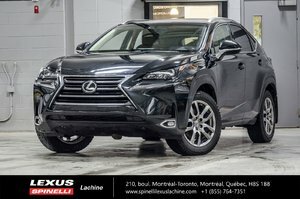 JAMAIS ACCIDENTÉ, GARANTIE LEXUS JUSQU'AU 20 AVRIL 2022 OU 110,000 KM. TRACTION INTÉGRALE, TOIT-OUVRANT, CAMÉRA DE RECUL, INTÉRIEUR CUIR, SIÈGES AVANT ÉLECTRIQUES / CHAUFFANTS ET VENTILÉS, SIÈGE CONDUCTEUR À MÉMOIRE, VENTILATION AUTOMATIQUE BI-ZONE, AUDIO PREMIUM LEXUS AM / FM / CD / USB / MP3 / BLUETOOTH / RADIO SATELLITE INTÉGRÉ À 8 HAUT-PARLEURS, VOLANT EN CUIR / CHAUFFANT / INCLINABLE ET TÉLESCOPIQUE ÉLECTRIQUE AVEC COMMANDE AUDIO / BLUETOOTH ET RÉGULATEUR DE VITESSE, SYSTÈME SMARTKEY, DÉMARRAGE À BOUTON POUSSOIR, HAYON ÉLECTRIQUE, JANTES EN ALLIAGE LEXUS 18’’, LONGERONS DE TOIT, PHARES ANTIBROUILLARDS (DEL) ET ENCORE PLUS!! Cylindres : Moteur 2.0L Turbo compressé de 235 ch / 258 lb-pi - 4 cyl.